From red carpets to shopping malls to Parliament Hill, the ubiquitous “selfie” has become a nearly unavoidable facet to life on Earth. And now, thanks to the folks at NASA, that global reach has once again extended 75 million kilometres away – to Mars. On Friday, the space agency published a stitched-together mosaic of 57 images snapped by the Curiosity Rover, taken in late January. It’s the third time the rover has beamed a “selfie” back to Earth. The vivid photo shows Curiosity nestled within the “Namib Dune,” a region where the rover had been collecting sand samples for lab analysis. 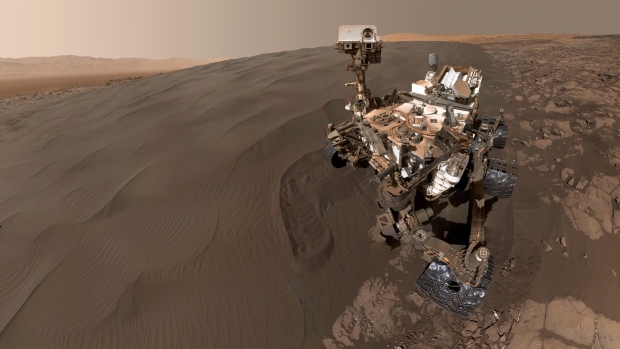 “The rover has been investigating a group of active sand dunes for two months, studying how the wind moves and sorts sand particles on Mars,” NASA explained in a statement on their website.